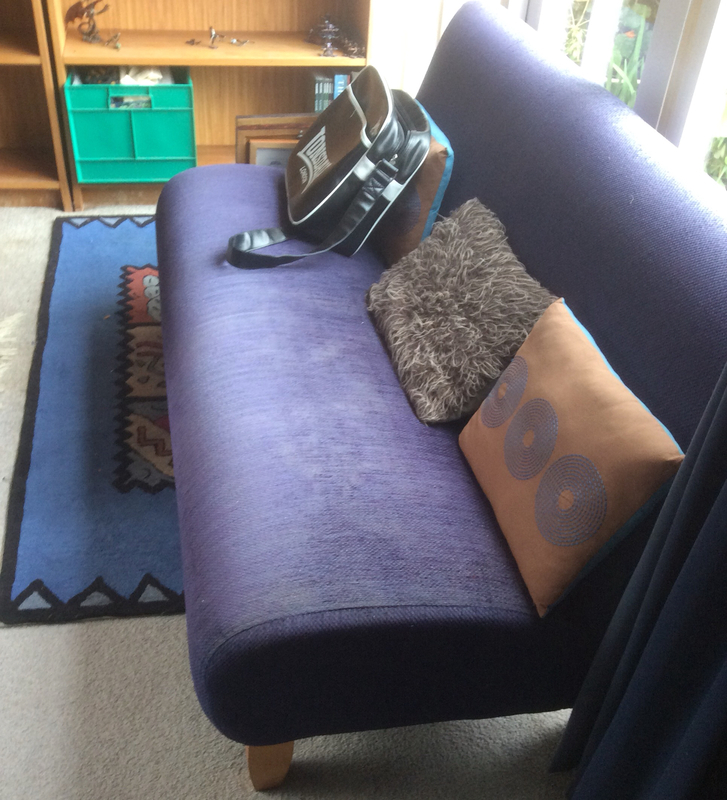 There are two Rimu bookcases which I have cleared a lot of clutter out of. They now have my large models in it plus a couple of armies - Ogres and Dark Eldar. 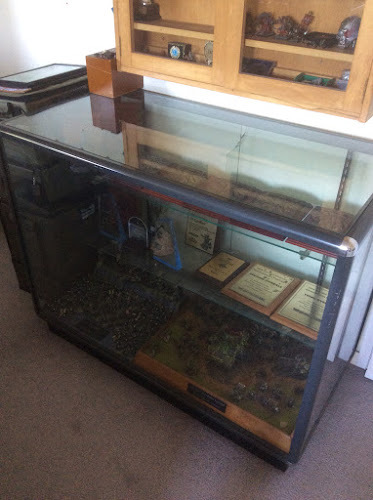 Awhile ago I purchased a retail display case off TradeMe. 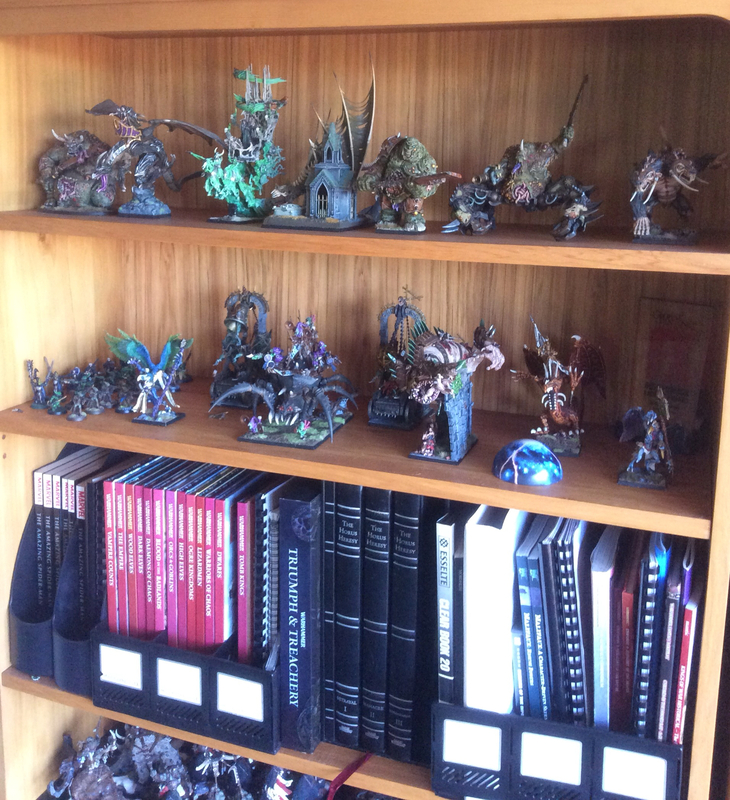 It now contains my Ulthwe and first Death Guard army. There are also a couple of shelves for trophies including my Games Workshop Grand Tournament plaques. 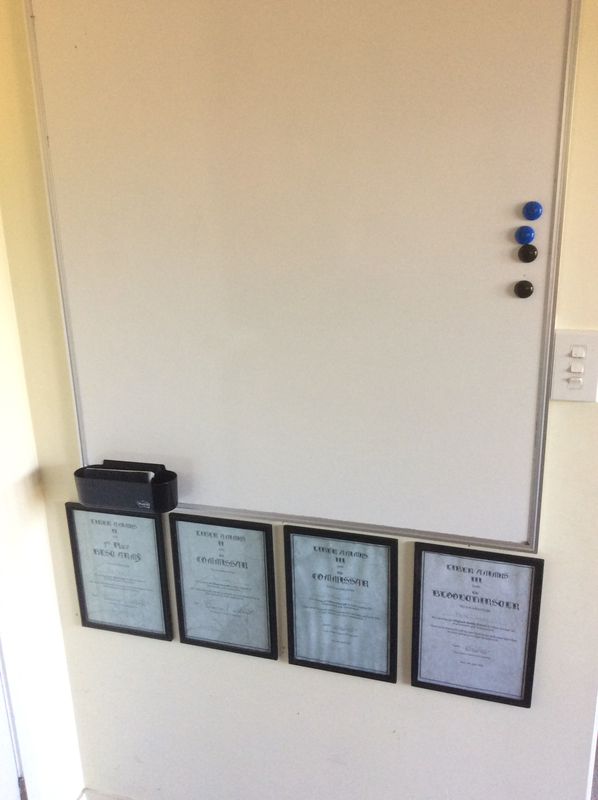 I picked up a white board when my last employer was selling things off. This should prove useful to keep track of things over time as well as acting as a very visible "To Do" list. The big guys on their shelves. 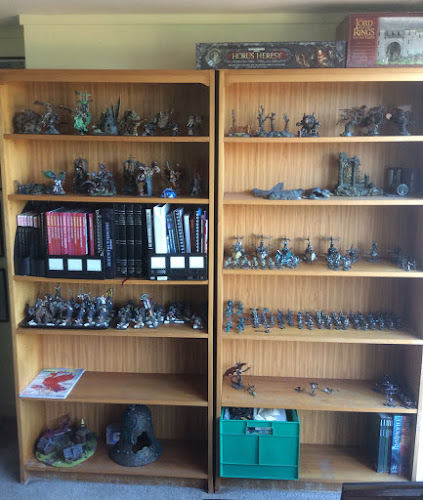 About ten years ago I was quite lucky when Games Workshop Wellington changed locations. They replaced their storage units and the manager let me grab one of the units they were scrapping (thanks Nathan). These are great. They are solid with four deep drawers on each side. Here you can see Jack's 4000+ point Dark Elves and the overflow of my Daemons in one drawer. 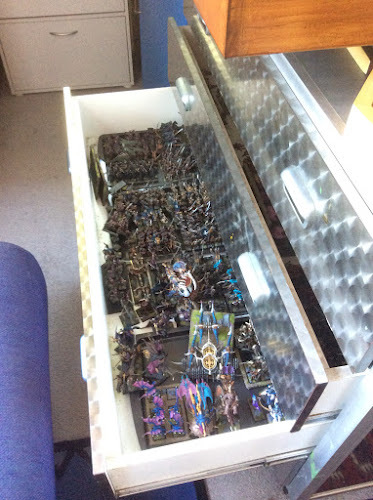 On the other side I have more armies plus the bottom drawer. 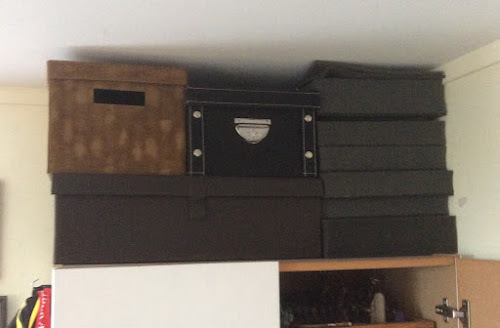 Is my Fantasy bits box. In one corner I have a storage cabinet which I have added extra shelves to. 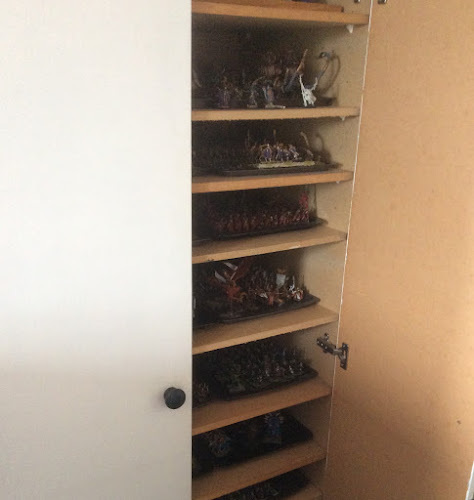 Here I've got a lot of my Fantasy/KoW armies stored. On top of the cabinet are my 28mm historical armies - Vikings, Mongols and Late Romans. 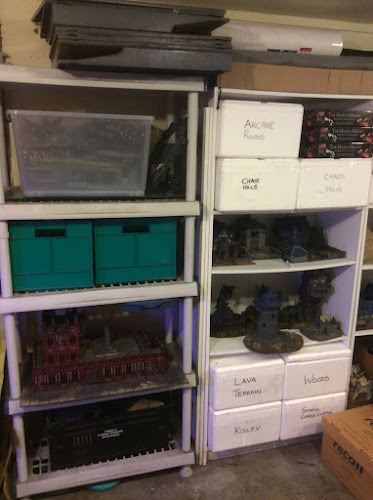 Also there is space for extra foam trays. And I grabbed a couch from the family room when we bought new furniture. 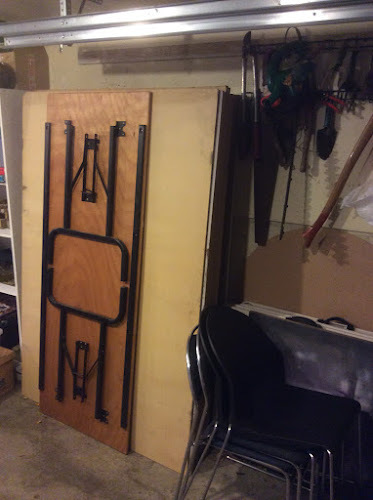 Through the door into the garage I have shelving units against one wall. 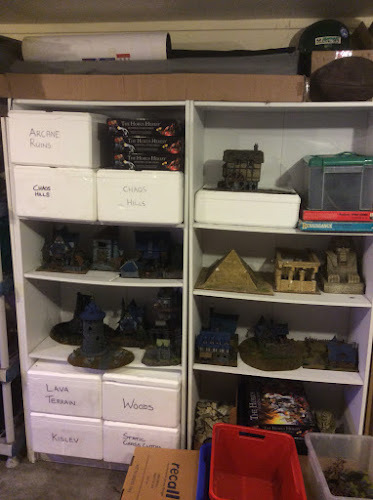 There were two storage cupboards which I've taken the doors off and used to make shelves.in these my terrain is all boxed and stacked. 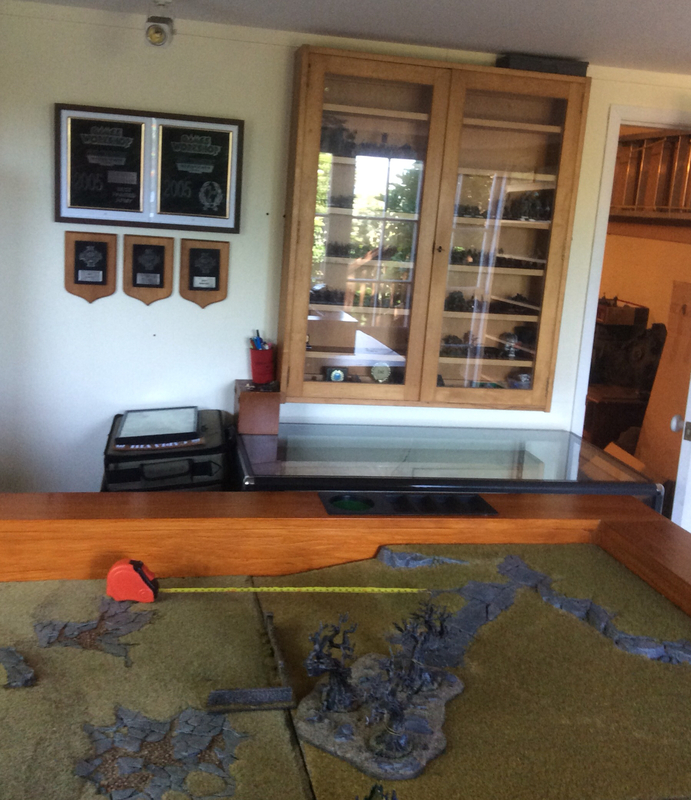 On top of the cabinets are extra RoB gameboard tiles and my gaming mats. Finally I have my tables stored plus a number of trestle tables. 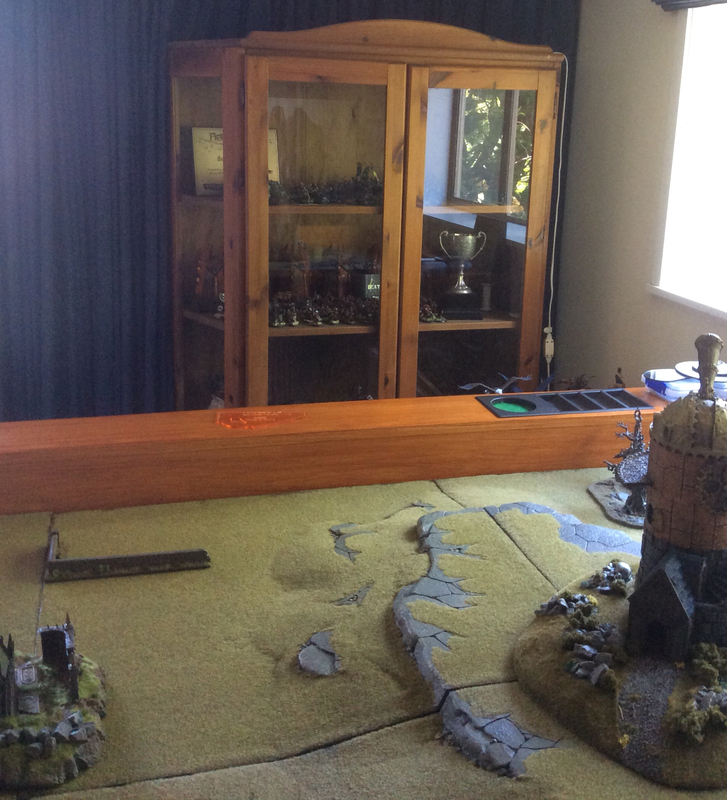 I'm keen to shed a few tables but keep enough to allow me to run a tournament weekend at home. 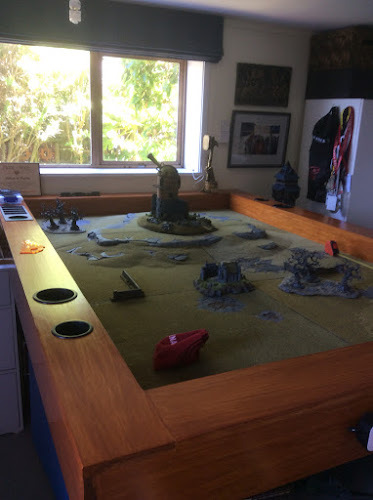 In the past I've managed to get ten tables going at once. And working away around the clock is my own little forgeworld cranking out terrain for me. 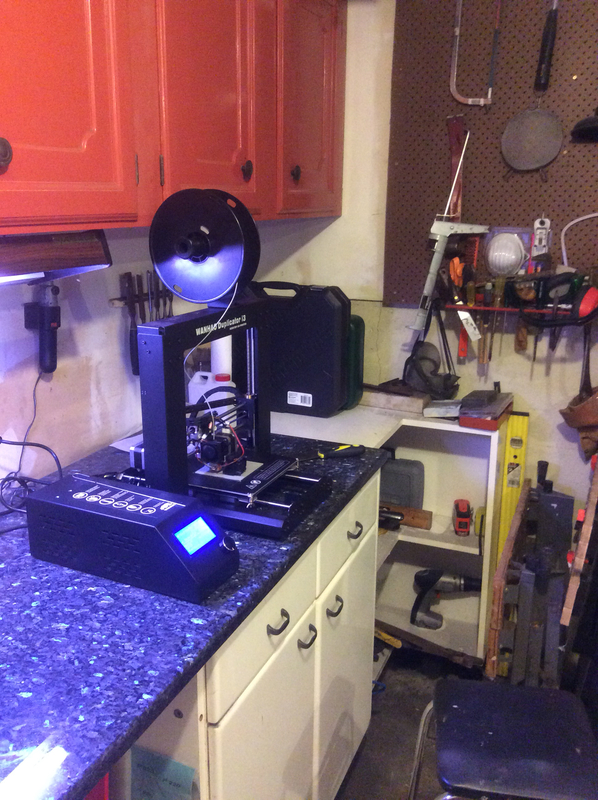 The 3-D print set up is quite compact so I just have it mounted o an old granite bench we stripped out when we did our kitchen. 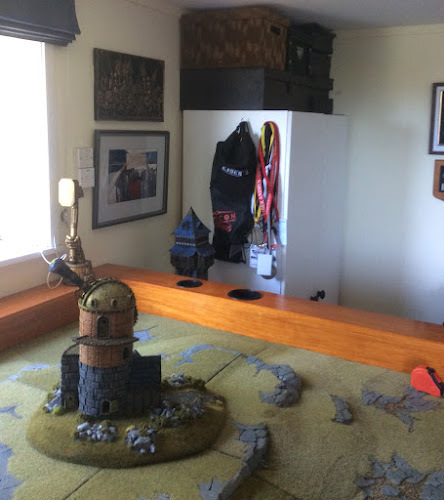 It has been pretty therapeutic to get some organisation to the area and remove a lot of the clutter and mess I had down in my gaming room. I'm lucky I have such a supportive and sympathetic wife who's let me commandeer the area. Nice to have things clean for 2017. 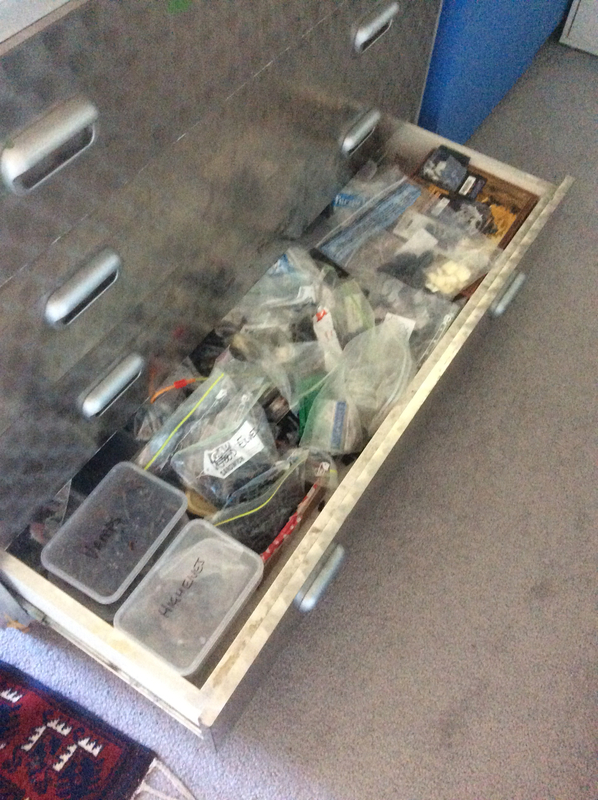 Very organised Pete - a lot of work up front but will save heaps of time in the future. Absolutely amazing! Remind me to drop you a line next time I am in Wellington! Great looking set-up. Thanks for sharing. 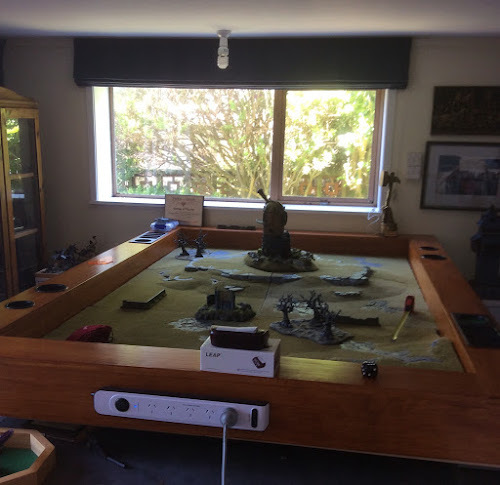 Gaming is the like by the everyone and there are lots of people who prefer to play the game in their home which called as indoor gaming and in the indoor gaming the snooker, ping pong, table tennis, and Foosball are very common and many people design their custom gaming table for playing the game in their home. The following component to take a gander at is the accessible memory. The memory on a gaming PC ought to be no less than 1 RAM. More is better. The Falcon Northwest Mach V, find out here for instance has 12 GB. It's particularly important in case you're running numerous games on a similar PC. There are pro gamers around that can be given contracts unblocked games guru by large companies to take part in either team events or individual events at large gaming tournaments.